There was a time when the U.S. Army foresaw the need to launch more than 400 nuclear weapons in a single day should Soviet Russia attempt to invade Western Europe at the height of the Cold War. It was with this doomsday scenario in mind that army researchers developed a recoilless, truck-mounted rifle capable of lobbing nuclear-tipped munitions at the incoming Red Wave. Because, clearly, the end of humanity was a small price to pay for winning an ideological conflict. In all, the U.S. anticipated the need for more than 150,000 nuclear weapons should a protracted war break out—106,000 for tactical battlefield use, another 25,000 for air defense, and another 20,000 for miscellaneous Allied uses. 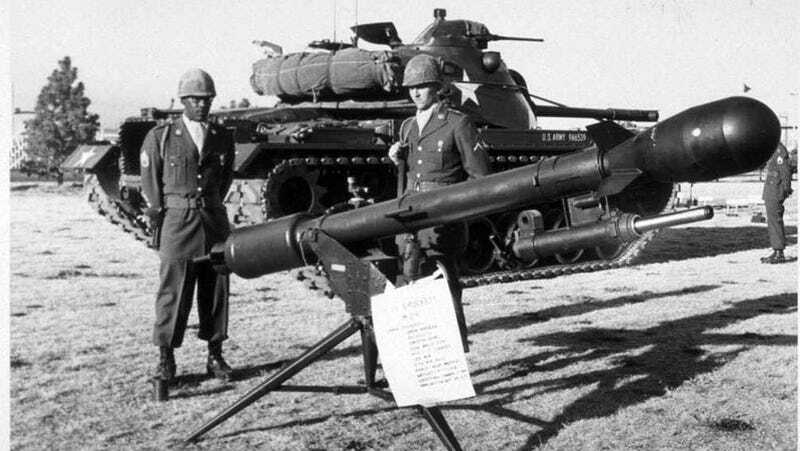 Dubbed the Davy Crockett Atomic Battle Group Delivery System, this weapon would have been on the front lines defending against the Soviet invasion. The 120mm M28 and 155mm M29 Davy Crockett launchers were recoilless rifles that could be tripod mounted on an APC or directly mounted to a Jeep, utilized by a three-man firing team, and launch two varieties of M388 279mm tactical nuclear projectiles. These M388 projectiles weighed about 75 pounds, measured 31 inches long, nearly a foot in diameter, and basically looked like an RPG swallowed a watermelon. They were armed with either a conventional high explosive charge or a variable-yield W-54 atomic fission warhead (a precursor to the warhead employed by the W61 tac nuke) capable of delivering between 10 to 250 kiloton yields, as selected by the user. The round would be loaded into the barrel (well, its "spigot" was) while a propellant charge would be loaded into the rear breach. The 120mm "light" iteration had a maximum range of 1.25 miles, the 155mm heavy version flew 2.5 miles. Both versions offered a minimum downfield range of just 1,000 yards—not nearly far enough to offer even modest protection from the ensuing nuclear holocaust. It produced lethal levels of radiation up to a quarter of a mile away, but would have proven viciously efficient at laying waste to Soviet troop formations and empowering infantry platoons to decimate entire heavy mechanized divisions with a single strike. The system was reportedly assigned to a number of USAREUR (United States Army Europe) armor and mechanized and non-mechanized infantry battalions stationed along the Inner German border in the Fulda Gap. More than 2,100 M388 projectiles were produced beginning in 1956. However, the Davy Crockett wasn't nearly as good a shot as its namesake. Its first warhead test, conducted on July 7, 1962, only flew 1.7 miles and constituted the final atmospheric test detonation at the Nevada Test Site. Subsequent firings between 1962 and 1968 at the Pohakuloa Training Area on Hawaiʻi island used 714 M101 spotter rounds (not live warheads).